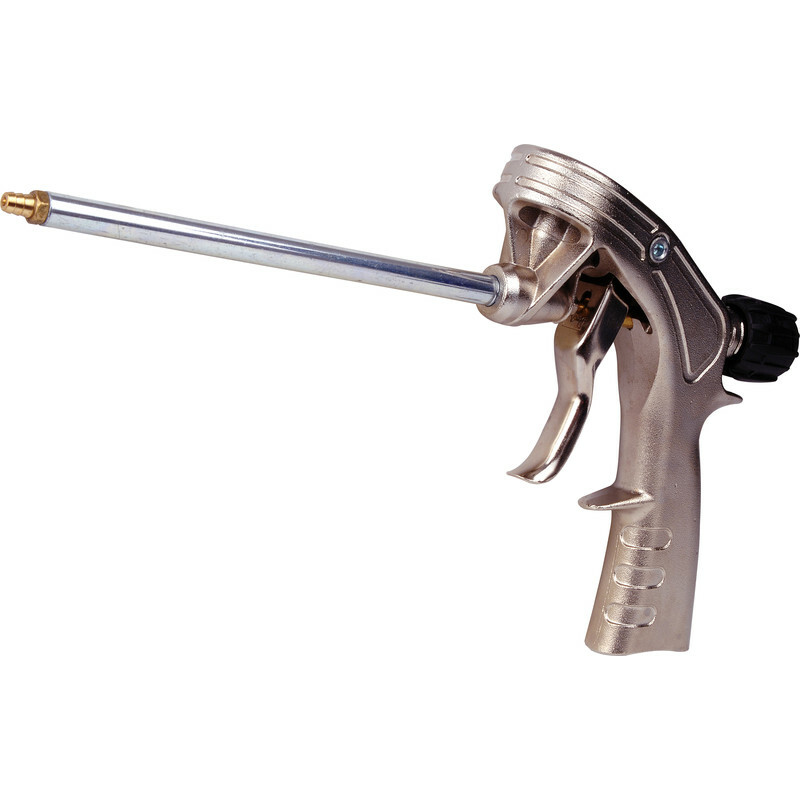 Professional foam dispensing gun. Plastic clad metal handle. Solid metal body. Professional Foam Gun is rated 4.6 out of 5 by 33. Rated 5 out of 5 by Alan59 from Great control The foam gun has so much more control than the standard cans so you can accurately deliver just the right amount of foam saving unnecessary waste. Rated 5 out of 5 by MatthewTheWriter from Briliant but A friend lent me his and it stopped working, so I bought a replacement. It is brilliant but it is vital that you follow the instructions to the letter to stop it bunging up. Rated 2 out of 5 by Kims from So difficult to clean Because I use them a lot I need to buy them but cleaning and maintainece is long winded, they should be easier to maintain. Rated 2 out of 5 by Homefarm from Poor manufacture The nozzle and needle valve do not close completely, even when the screw is tightened down. To be fair this is the first one that I have had a problem with and I have bought a fair number over the years. Rated 5 out of 5 by Cheltenhamboy from Worth the extra! Nice bit of kit. have been using the cheaper version with plastic parts for a while but this one was only £3 more and well worth it.